Pretty cool set there warrior. I´d like to get my hands on Stone Cold. Any new extra material on The Monster Squad? Sadly the Monster Squad Blu Ray which is from Olive Films is bonus free but on the positive side the picture quality is really good! Loads of cool looking pick ups there Atomik would like to check out Maxie and Buy And Cell in particular! Wow! The Caller (1987) with Malcolm McDowell and Madolyn Smith Osborne. What a memorably weird little two-character Charles Band thing! It's a film with terrific acting by the pair and an ending right out of thin air that you won't guess in a million years. If you haven't seen, don't read any spoilers, and try to find it. It's a different, cool low-budget film. I've added four vintage Brigitte LaHaie titles to my collection. from various other vintage Alpha France titles. The films of Bridget Lahaie. You're a sick, sick man. Love it! I'll take that as a compliment ! Oh definitely. You are a man after my own heart. Lahaie was always pretty entertaining in her work with Jess Franco. and it certainly does not make me feel less happy about this beautiful package ! Gotta love your stuff, my friend. You can't go wrong with the great Rudy Ray Moore. I saw Dr. Butcher, M.D. at the seediest Philadelphia grindhouse the day that it opened. What an experience! It was distributed, not by an exploitation giant like New World, Avco Embassy, or Cannon, but by New York City's Terry Levene and Aquarius Releasing. I love those guys like Levene, Jerry Gross, Brandon Chase, and Joseph Brenner, trying to peddle foreign crap to the urban market, basically with only a few prints in a few cities at a time, all from "headquarters" located in a walk-up in some trashy neighborhood. Levene was great because he always used the booming voice of Adolph Caesar in his trailers. And his, as they used to say, "ballyhoo" promoting the films was something else. For Butcher, he parked an ambulance outside the theatre with fake doctor and nurses with rubber body parts. Those were the good old days where you got a show inside and outside the theatre. I would have loved to have been around to see these guys dreaming up ad campaigns or sitting in a cigarette-smoke haze in some dismal editing room making stuff more accessible to U.S. audiences. Frank Henenlotter got a favorable quote for his film Frankenhooker from Bill Murray, of all people, who was editing Quick Change in an adjoining editing studio. Can you picture that image? Bill Murray watching the rough cut of Frankenhooker? Fantastic! Your knowledge is killing me Crash. I wish I would've paid more attention to this stuff when I was younger, and gone to film school at NYU. I'd love to have the knowledge to write and direct/produce indie films. I picked up a load of DVDs at the dollar store. Here is a list, and I am hoping maybe some of you can give me any info on two of them, as I can't find any information on them on IMdb. They are all from Echo Bridge Home Entertainment. I can't find The Million Dollar Highjack on IMDb. There is no description of Street Killing either. Thanks for any help. I can't wait to watch the 7 Movie Action Pack. I will probably watch them at camp in the late fall/ early winter. My Dad gave me a small DVD player and I am going to hook it up there soon. I love the rewind because I get the chance to keep obscure or lost film history alive with these posts. And I hope that I succeed in giving my fellow film-buff friends a taste of what it was really like to see stuff in a scary grindhouse 30 or 40 years ago or work at a drive-in as a projectionist showing stuff like Gone in 60 Seconds and Amuck. We never thought twice about risking our lives at those seedy venues. Now, you don't even have the opportunity anymore. As I grow older, I even get nostalgic and have fond memories of trying not to retch from the smell in that Philadelphia theatre or get stabbed in the balcony. Movie-going was once an adventure! 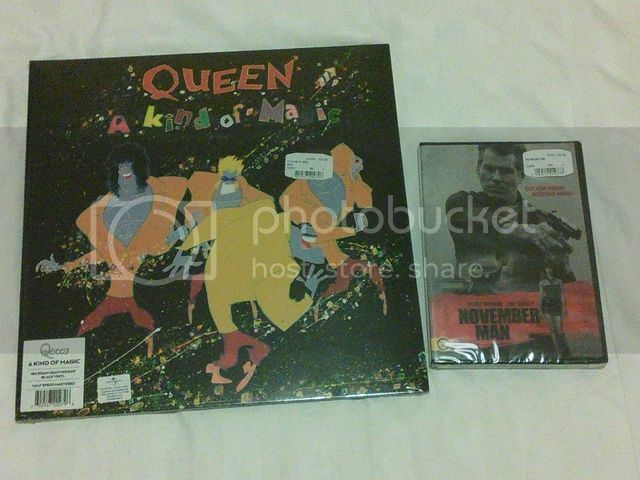 Queen A Kind Of Magic Lp and the Pierce Brosnan movie The November Man on Dvd which for some reason has been released more or less everywhere except the UK due I imagine to no one yet picking it up for distribution! That cheesetastic action 7 pack sounds fun Pittsburghgirl though the names of the titles don't ring any bells! Thanks YW. They must be some seriously obscure movies. November Man was good if I am remembering the correct movie. I remember while eating breakfast at the Hilton Airport in Dublin every morning, I'd see his picture. They had pictures of famous Irish persons all around the dining room. Gotta love your stuff, my friend. I saw Dr. Butcher, M.D. at the seediest Philadelphia grindhouse the day that it opened. What an experience! It was distributed, not by an exploitation giant like New World, Avco Embassy, or Cannon, but by New York City's Terry Levene and Aquarius Releasing. There's a lot of background info on that among the extensive special features of this new 2-disc set. with interviews with several of the original cast members and special effects artists. Oh, and my copy came with a free barf-bag with Dr. Butcher print too. Lovely ! I like the zany Dr. Butcher, M.D., and would love to see the featurettes on re-cutting the film for the U.S. and the advertising campaign. I haven't seen Zombi Holocaust, another reason to get this special edition. Picked up Disorganized Crime (1989) and Indian Summer (1993) at a thrift store. I remember I liked Indian Summer. I've never seen Dislrganized Crime. Disorganized Crime I really enjoyed Pittsburghgirl I've got it on a cheap Blu Ray from the budget Us distributor Mill Creek Entertainment,it's a fun film with a great cast - Lou Diamond Phillips,Fred Gwynne,Corbin Bernsen etc. I think you'll probably like it! The last BD I purchased was Star Trek II: The Wrath of Khan (Directors Cut). Perhaps it was silly to purchase it considering I have the theatrical cut on BD and the DC on DVD. Latest Blu Ray pick ups - The Seven - Ups,Mystery Date,Invasion U.S.A and Secret Admirer. Too bad that the Secret Admirer blu is region A coded. Region coding is such a pain,i'm lucky as all my Blu Ray players are region free but I know many people don't have that luxury and I know how frustrating it can be,Secret Admirer was MGM so I'd imagine someone's bound to pick it up for a European release at some point especially as there's already a HD master of it doing the rounds! Picked up The Money Pit on Blu Ray and a seriously cheap like new condition region 1 DVD of the 1986 comedy Playing For Keeps which I've never seen before but at the price it was going at I thought definitely worth a gamble!